Karchers 2000 PSI K5 pressure washer is our highest power electrical machine, delivering high pressure cleaning for tough jobs. Pressurized hose reel conveniently protects and stores the hose. The patented induction motor is water cooled to increase life up to 5X. Vario and Dirtblaster<sup></sup> nozzles included to tackle most outdoor cleaning needs. Detergent tank included. 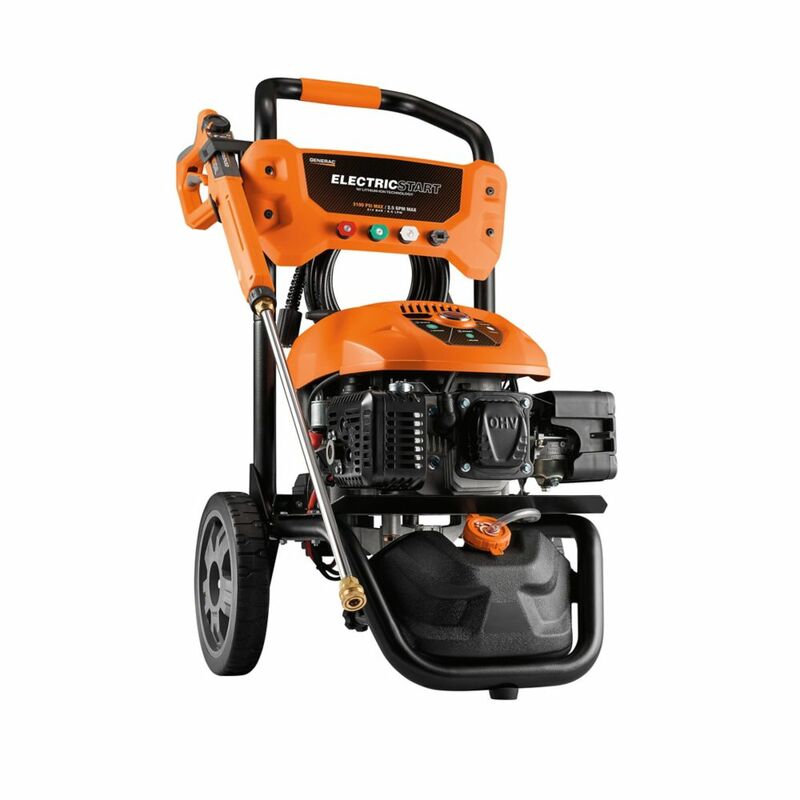 The Pressure Storm Series 2500-PSI 2.0-GPM Electric Start Gas Pressure Washer comes with a 6.5 HP 196cc Engine with a 1 gal. fuel capacity and low oil shutdown for protection. This pressure washer produces 2500 PSI and 2 Gal. per Minute of water with its Premium Anno Reverberi RMV Axial Cam pump. Includes a 16 in. gun, a lance, and a 25 ft. PVC high pressure hose with connectors. It features a hose hanger and a wand support on the frame for user convenience. With the panel mounted controls, everything is at your fingertips - Engine switch, push/pull coke lever, and both inlet and outlet water connections. This consumer duty pressure washer features a 1 in. heavy duty roll cage frame and large 12 in. Plastic Wheels for easy portability. Great for all your cleaning needs, patios, decks, fences, house siding, or your automobile or recreational vehicles. All parts to maintain and repair this pump are available. Battery Not Included. 3 Year Limited Consumer Warranty. 3100 PSI 2.5 GPM Electric Start Residential Pressure Washer is rated 4.4 out of 5 by 27. Rated 4 out of 5 by Alex from The power washer works, with one exception to be discussed later, very well. Plenty of water, pl... The power washer works, with one exception to be discussed later, very well. Plenty of water, plenty of force behind the water. Now, about the problem I have with the Generac power washer. I purchased the washer, at the end of March 2019, because of the electric start. The first two times that I used the washer the electric start worked well. The next time, out of nowhere, the engine stopped. I went to restart and the start/stop button wouldn't work. I started the washer by pulling the rope and it started and ran well. Since then I've tried to use the electric start/stop button to no avail. The battery has been on full charge for all of the attempts to use the electric start. I stop the engine with the kill switch provided. I have a large two story house, so it takes quite a while for me to power wash it. I'm using the washer by starting it by hand and I will finish the job. After I finish the house I will take the washer to the closest home depot (Rehoboth Beach Delaware) for 3 year warrenty repair or replacement. Rated 4 out of 5 by BMan from Very good power washer. I would have given it... Very good power washer. I would have given it a 5 but the gas tank capacity could be bigger and you cannot use any cleaning fluids containing bleach. It is very easy to use and I love the electric start. Rated 5 out of 5 by DCoop from I have had several pressure washers in the past that just did not last or, in the case of the ele... I have had several pressure washers in the past that just did not last or, in the case of the electric one I tried, did not have the power I needed. My driveway is large enough to park 10 vehicles in and turn my truck completely around in, it took only about two hours to clean! We use a rotating brush on the drive and walks and this unit has the power to make it work quick and efficiently. Also, when using the high power nozzle, I no longer have to use a ladder to reach the higher gutters on the dormer areas of my house. But aside from all that, the electric start is the deal sealer! My wife loves it too! We argue over who gets to use it now. Rated 3 out of 5 by Derek from Great pressure washer other than the water and pressure hose... Great pressure washer other than the water and pressure hose hook up. Not much clearance on bottom of pump especially when hooked up it is difficult to move without the risk of damage. Electric start is a nice feature. Started up on second attempt right out of the box. It says with battery, is it cordless? Does it have a cord that can be used with an outlet? Yes, it is cordless. The 3100PSI includes a rechargeable battery and charger. The 3100 PSI electric start pressure washer is already equipped with electric start and recoil pull start.